The HDD partitions are created with flexible 1GB partitions that can be used in combination to match the size of the project being stored. This process saves space and allows for more projects to be stored on the HDD. AutoCopy feature: Fast duplication without pressing any buttons. Auto-Counter Technology: Displays the total number of discs successfully copied compared to desired output for each project. Hard Drive Partition/Image Name Editing*: Simply stated you can name the images stored on the hard drive partitions. User friendly interface with 'easy-to-read' LCD display: Offers easy to recognize and use terms and operations on the LCD display for simple usage. Aluminum Case used to provide a highly functional and attractive exterior: Duplicator casing available in metallic silver or midnight black aluminum casing. Fast Key Support: 4 fast keys for faster operations. Power on Self diagnostics: Keeps the duplicator functioning optimally. Disc Info feature: Provides the format of the disc & the disc manufacturer's information. Selectable Disc burning speeds: Ability to increase or decrease duplication speed for supported formats. Automatic format recognition: Duplicator recognizes automatically if the discs are CD or DVD as well as the correct format to copy. 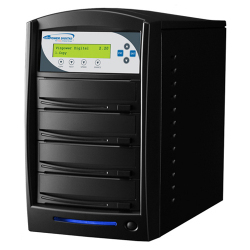 Upgradeable for future drive technology: Able to upgrade duplicator for installation of future drives. Future functions upgradeable through firmware: Duplicator able to upgrade future software updates via Firmware. Continuous copying without waiting for cool down: No need to stop the duplicator for fear of overheating. Optional External USB 2.0/Firewire IEEE 1394 connection: Able to connect specific drives to a computer to generate a master disc for duplication. **Available only on specific models. *Such spec varies based on the size and number of drives. This item can only be exchanged for the same product from our manufacturer. Unfortunately, we are unable to accept returns for refunds under any circumstances. Upon return, this item will be thoroughly inspected and tested, and should it be determined that any damage was caused due to misuse, neglect or abuse, the return will be refused. If you would like to return for replacement, you can ship your item back to the manufacturer during 1 year warranty period. You are responsible for shipping costs. Please allow 1 - 2 business days to build these machines before shipping. This tower is excellent and works great. I have burned every format other then Dual layer, but I plan to try those out soon as I have 100 pack on the way.